NZ What made you buy a Tesla Model S? KO I wanted to support the paradigm shift toward cleaner, more environmentally friendly vehicles without sacrificing comfort, style and performance. Weaning ourselves off of foreign oil is enticing and doing it with the Model S made here in America is exciting. Saving a few thousand dollars a year on gasoline is important also, and I expect servicing will be much less expensive. NZ You mentioned a reservation roller coaster period. KO I put down the $5,000 deposit 2 ½ years ago, felt proud to support Tesla Motors. Although I wanted the Signature Series, $40,000 was too much. Later, I noticed it was still available, hoping it wasn’t a glitch. I confirmed it and put down the additional $35,000, reassuring myself they would deliver it. My modest deposit and casual interest turned serious. My trepidations were alleviated at the factory tour & test ride event where I witnessed the Model X at the Tesla Design Studio in Hawethorne, CA while speculating the Model S production mid-2012. At the official June 22 launch, the first 10 cars rolled out, introducing the “Get Amped” series. I finally got to drive it and it blew me away. The reservation roller coaster continued with news slow production raising my anxieties. It has definitely been worth it! 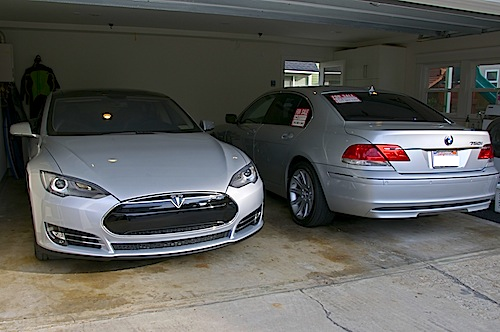 NZ You have a For Sale sign on your gasoline sedan next to your Model S.
KO Yes, I guess it is kind of funny isn’t it? I’m not a big car guy but I like driving nice cars. We try to be environmentally conscious but I like performance cars and luxury hybrids are hardly that fuel efficient. NZ Can you share some of your driving experiences so far? KO I didn’t expect going from gasoline to electric would phase me, but it did. I got used to what the car could do based on my “spirited” driving. We went on a weekend trip apple picking in the San Bernardino Mountains 100 miles away that first weekend. The 200 mile round trip and local driving should be enough. I checked charging options and found a Walgreens public charging station. The charing experience was just as expected, flawless. I wondered around the resort looking for electric outlets and a staff member showed me one close to our room. We then drove to Los Rios Rancho apple orchard in Oak Glen, CA at 8,500 feet and despite wanting to push the car on those winding mountain roads, I kept my passengers in mind while tracking my range before leaving. I wanted to see how much electricity I could recoup using regenerative braking on the way down. We ended up with as much range as when we started. Later I made two very similar 100 mile trips to Riverside with 3 adults, 85 degrees outside and AC on. I drove 75-80 mph and 140 miles on surface streets. I pulled into the garage with 40 miles left of range after driving 202 miles with a few bouts of accelerations. With 272 miles of range, I averaged 90% of the EPA range driving the way I like to drive. A “crotch rocket” pulled up next to me at a stop light revving his engine and caught up with me at around 80 mph. That was entertaining. NZ What does it feel like driving the Model S? KO The Model S is faster, smoother, quieter, and more nimble than any other car I’ve owned. The regenerative braking is different in a good way. I like the way it works and how little you use the brakes unless you’re coming to a complete stop. You ease off the accelerator to control your speed. It’s about the same weight as my heavy BMW 7 Series but feels better. It’s very responsive and handles as if on rails. It’s a performance car, yet smooth and quiet. The smooth quiet ride, comfortable seats and quality audio system makes enduring LA traffic more palatable. The display screen and controls are very easy to use with what you access/control at the touch of the steering wheel. More advanced features are coming allowing you to control charging or adjust the climate remotely. Now you understand why Kelly will sell his BMW. It’s obvious by Kelly’s smile he’s a happy camper. What was interesting is that his story is similar to those who drive and understand performance cars but come to this electric vehicle world unsuspecting the amazing torque delivery electric motors have. Kelly is one of the many happy Tesla Motors Model S owners to the point his BMW 7 Series is up for sale. It was funny, I couldn't help seeing the irony, especially after the great talk I had with BMW. I feel this is going to become a more and more familiar picture. What a difference from 2007! I am currently enrolled in a Top 25 MBA Program where I have based multiple research reports around Tesla Motors. Through hours of research into the company and its products, I have determined that when I graduate in early 2014, the Model S will be the gift to myself for completion. Kudos to Tesla, Mr. Musk, and team for bringing automotive excellence back to America. That's fantastic to hear, especial;ly coming from your generation that stands the most from adopting these cars as an every day fact of life. Congratulations to you, also.